My Take on it – Robert Redford is a great and iconic actor who has been in some of the best movies made. The look and feel of this movie screams that it was made in the 80’s (which is quite often a good thing) but the plot just isn’t interesting enough to keep us glued to the screen for nearly two hours. The casting of Redford baffles me here because he is so much better than what he is given to work with here. Having him play opposite Daryl Hannah and Debra Winger is completely wrong and most of their scenes together are just laughable. There are so many more entertaining and enjoyable movies out there than this barely mediocre film gives us. The one thing I enjoyed a lot was noticing lots of now known actors playing small roles in this film. Bottom Line – Very 80’s in its look and feel, but by no means an interesting courtroom drama. 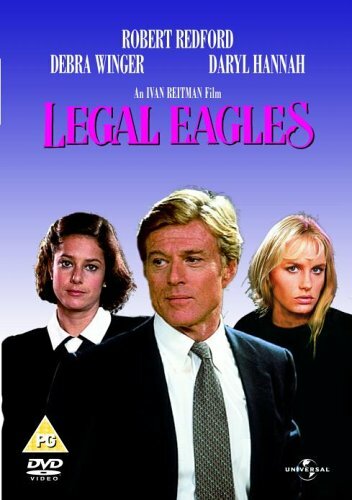 Redford seems so miscast here with Winger and Hannah that some of their scenes together were just laughable. There are so many better movies out there to watch because this one is mediocre at best. It’s been a long time since I’ve seen this film, and I forget what it’s about. Really not one of anybody’s best films. I applaud your determination to sit through this more than once. You just broke my VC’s heart. She adores this film, and thinks Redford and Winger are at their cutest here. It’s not really one of my favorites, so it might be a girl thing. She reads my posts too?? I’m honored. Sorry to disappoint. Just didn’t work for me. They had no chemistry together at all. Of course she does, at least when it’s something of interest to her. She’ll probably have me see this soon too. Does she also review? Maybe she wants to contribute to argumentative august? I’d love to have her partake! No, she leaves the reviewing to me but doesn’t hesitate to voice her opinions through me. Nice review. I always wanted to see this one…. Ha, I watched this the other day for the first time in years. I thought I had fond memories of it until I started watching and realized it is really a boring 80s mess. Pretty girls though!